I was lucky enough to come across this 2 seater lounge whilst on holidays. Looking quite familiar and with that amazing teal coloured vinyl I made it mine as quickly as I could! 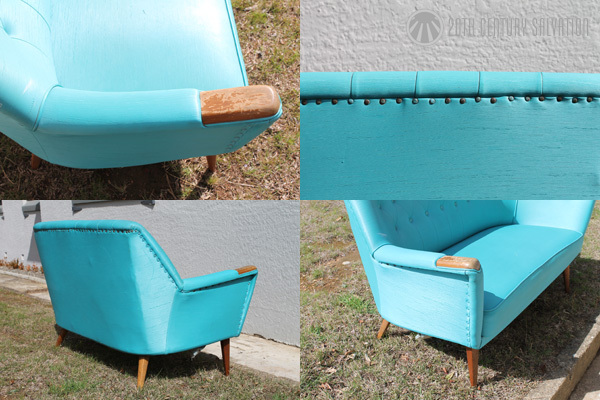 The lounge appears to of been manufactured by Paul Kafka (I have done a post on him recently here) and although there are no visible maker’s labels or stamp, the styling is quite distinct and easy to identify with the angled legs, flared armrests, timber inserts (hand rests) and buttoned/stitched rear back support. In need of a little love! Overall the condition of the lounge is reasonable to good. There are a few nicks and one minor tear to the vinyl (also needs a thorough clean), the timber hand rests and legs need refinishing and the cheesecloth cover to the underside needs replacing and over the next few weeks I will be completing each as required. 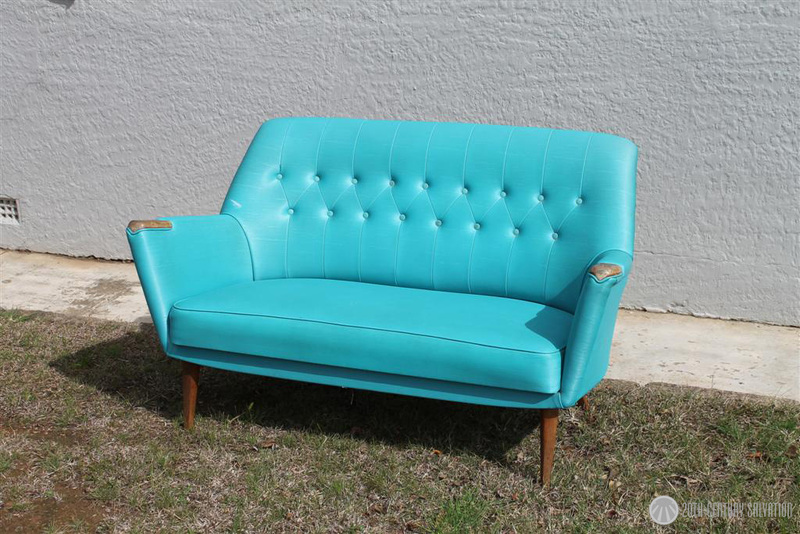 With plans to use it as a loveseat at my upcoming wedding I’m really looking forward to getting stuck into it! I’ll be sure to update along the way. Best bet would be to try a few second hand furniture shops, they usually have a nice little collection of spares. Another option could be a re-cycle centre at your local tip, you may be able to find a cheap chair/coffee table that uses a similar fixture that you can buy/transfer over to your armchair!